ROME — Napoli is not only Dries Mertens and Lorenzo Insigne. The win also solidified Napoli's hold on second place in Serie A. The Partenopei moved six points ahead of third-place Inter Milan, which lost 1-0 to leader Juventus on Friday. Juventus is eight points ahead of Napoli. 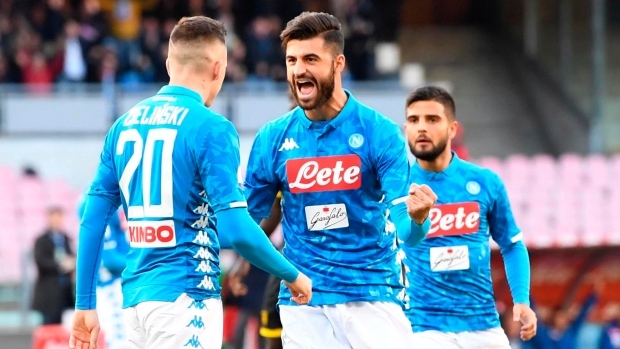 "This was a dangerous match, a classic trap that we could have fallen into, especially ahead of a Champions League game," Napoli coach Carlo Ancelotti said. "Those who debuted or made their comebacks today should be applauded, as they knew how to wait, prepare and were ready when called upon. "We can start thinking about Liverpool now, but we've got to try to remain calm and focused. We're entering with the right mentality, the players are in good shape and a few even rested today." Goalkeeper Alex Meret, who was signed from Udinese in the off-season for 22 million euros ($25 million), made his Napoli debut. Signed to replace the departed Pepe Reina, Meret broke his arm in his second training session with Napoli. While Meret was rarely tested, Zielinski put Napoli ahead early on from the edge of the area following a rebound of a shot from Insigne. Ounas then doubled the advantage before the break with a long curling shot that was deflected slightly by a defender. Milik headed in his first in the 68th and then beat the offside trap for another in the 84th. Milik has scored seven goals in 13 matches, matching Mertens and Insigne for the squad lead. Both of Milik's goals were set up by Ghoulam, the fullback who had been out since tearing his anterior cruciate ligament last year against Manchester City. Nine-man Cagliari scored a last-minute equalizer to earn a 2-2 draw against struggling Roma — which is at risk of missing out on the Champions League places. Cagliari coach Rolando Maran, Luca Ceppitelli and Darijo Srna had all been sent off for dissent when Marco Sau completed a counterattack by sprinting past four defenders in the fifth minute of added time. Roma was leading 2-0 before Artur Ionita's header in the 84th sliced the lead in half. Bryan Cristante and Aleksandar Kolarov scored in the first half for Roma. Roma remained seventh — and at serious risk of dropping down the table following Sunday's matches — while Cagliari moved up to 13th. Roma has won only one of its last seven matches in the Italian league. However, the Giallorossi have already advanced to the knockout stage of the Champions League as they attempt to follow up on last season's run to the semifinals. Roma visits Viktoria Plzen on Wednesday in a match that really only has implications for Plzen, which is attempting to hold on to third place in Group G and a spot in the Europa League. Riccardo Saponara scored with an acrobatic volley nine minutes into stoppage time to earn Sampdoria a 2-2 draw at Lazio in a wild finish at the Stadio Olimpico. Lazio's Ciro Immobile had converted a penalty in the sixth minute of added time after the VAR ruled there was a Sampdoria handball on a free kick. Sampdoria led for most of the match following an early goal from Fabio Quagliarella but Francesco Acerbi equalized for Lazio in the 79th. Lazio moved level on points with fourth-placed AC Milan ahead of Milan's match against Torino on Sunday.